As you can see, there is a decent mix of shapes - some rounded (Bobbi Brown, 129), some tapered (Hakuhodo, 138), some slightly flattened (Chanel, 116) and one flat/dense (109). My favourite for powder bronzer? My beloved Bobbi Brown brush, before the re-boot and re-shape. But as I can't get these anymore, I'd go with the MAC 129. My favourite for powder blusher? This one is a tie - the Chanel #4 and/or the Hakuhodo medium Yachiyo - both are sooooooo soooooft and beautiful. The Hakuhodo has a slight edge. Or for a more strong finish to a powder product - especially a mineralised product that can benefit from a bit of a buff-and-polish into the skin - I'll use the MAC 109. Easy - this tends to be simply my fingers, but on occasion I will also reach for the MAC 109 to buff product out. Hands down, the Hakuodo above, but as it's slightly harder to get and slightly more expensive, on those occasions where I can only bring one with me, I'll reach for the MAC 138 - it's basically a mop-brush; tapered almost to a point - so it can be used as a soft contour brush and highlighter brush, it's also big enough to be used as a powder or bronzer brush. And of course it's great as a blusher brush. The bristles are nicely soft to boot. And I don't care if I lose it. 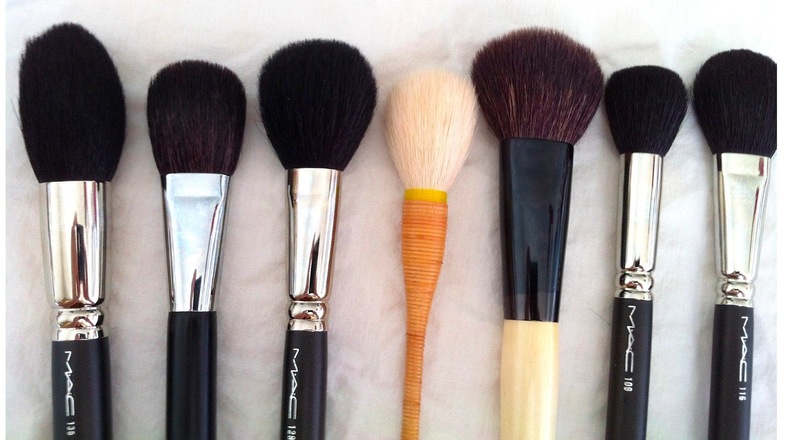 In general, I think I've personally found that I tend to favour natural fibre brushes for powder products over synthetic equivlents, and my fingers for cream products. I do have a bunch of other (including synthetic fibre) brushes that I like - Illamasqua make a gorgeous one in particular. I also use dual fibre brushes and fan brushes to apply blusher and bronzer - especially in the summer, I'm loving my Louise Young SY20 Super Fan brush at the moment for everything; bronzer, contour, blusher and highlighter). The above brushes are simply more or less "standard" shape blusher brushes I have in my personal kit. Look here for some info on how I clean my brushes - and a review of a lot of different cleaners :-) and here for some information on how I store my brushes.